Make no mistake. Redbox rentals were hurting DVD sales and undercutting the studios’ other revenue streams. Its dollar-a-night rentals accounted for roughly one of every five dollars consumers spent on DVDs last year, and it returned a far smaller share of that dollar to the studios than Wal-Mart sends them when it sells a DVD. And from the studios’ perspective, the trend lines were getting worse. Something had to be done. You can read my take on what else the studios might have done here. But let’s take a moment to consider how they accomplished what they did. There is nothing illegal, unethical or even unusual about Redbox’s business model. Under Section 109 of U.S. copyright law, commonly referred to as the First Sale Doctrine, Redbox is perfectly entitled to rent the DVDs it purchases without the permission of the studios, just as Blockbuster or any other video retailer is. For the same reason, it’s entitled to charge whatever it wants for those rentals, including nothing at all. Thus, the studios had no legal grounds on which to try to prohibit or delay Redbox from renting DVDs. So they turned to other methods. They “persuaded” DVD wholesalers not to sell discs to Redbox so it would be harder for the retailer to obtain them. And by “persuaded,” I mean they threatened to cut off those wholesalers’ own supplies of discs if they persisted in selling to Redbox. Like Redbox, the wholesalers are legally entitled to sell the DVDs they buy from the studios to anyone they want, without the permission of the studios. But the studios are not required to sell discs to any particular wholesaler, and without access to discs from the studios, a wholesaler would have no business at all. Some studios then agreed to supply discs to Redbox directly, but only on condition that it accept roughly the same terms set forth in the settlement with Warner. Fox, Univeral and Warner, however, refused to sell to Redbox directly, even on those terms. They hoped, evidently, to starve Redbox out of business but cutting off its supply. Redbox, however, fell back on an old retailer trick. It sent armies of operatives out on days when Warner, Fox and Universal titles were released to buy up as many copies as they could at their local Wal-Mart, Target or Best Buy outlets. While more expensive than buying wholesale, it gave Redbox access to the discs the day they were released. Thus supplied, it then loaded the copies into its kiosks and began renting them, once again acting entirely within its rights under the law. The studios weren’t finished, however. 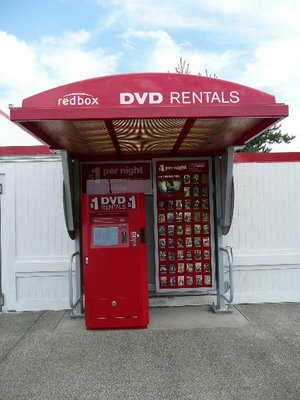 They pressured Wal-Mart, Target and Best Buy to stop selling bulk quantities of DVDs to Redbox operatives in a renewed attempt to cut off the kiosk operator’s supply. Since Redbox’s operatives didn’t advertise their affiliation, however, the big-box retailers could not limit their bulk purchases without limiting everyone’s bulk purchases. Which is what they did, imposing chain-wide limits of five DVDs per person, per purchase, thus inconveniencing not only Redbox but anyone who might, for whatever reason, want to purchase more than five copies of a movie–a holiday shopper, for instance, or someone organizing a raffle for the local high-school theater club. I’m assuming the studios’ were well-advised in their campaign against Redbox, and managed to strong-arm the wholesalers and big-box retailers without actually violating antitrust laws. But it’s still worth noting, I think, the extraordinary lengths to which they were willing to go to thwart the plain language and intent of an inconvenient portion of copyright law. The First Sale Doctrine was promulgated — first by courts and later by Congress — precisely to deny publishers control over the secondary market in copies of works. It evolved to ensure that the practical application of the copyright statute would not be inconsistent with the Constitutional purpose of copyright itself: “To promote the progress of science and useful arts.” It does that by encouraging a robust and innovative market in copies, including a robust secondary market. Through their many Redbox machinations, the studios have found a way around the plain purpose of the First Sale Doctrine by effectively (if not quite illegally) fixing the price of DVDs in the secondary market. There is no doctrine of contributory or secondary hypocricy in copyright jurisprudence, of course. But it strikes me that what the studios have done here differs only in degree, not in kind, with what they frequently accuse ISPs, search engine providers and P2P application developers of doing with respect to copyright law: They’ve subverted its purpose in pursuit of their own profit.